Over the past year, I’ve become aware of the local economy in Oklahoma City. It appears many others have as well. Locally owned restaurants and businesses are increasing in popularity and are always on my social media feeds. I have been on a quest to try some of the new restaurants I’ve discovered. My most recent visit was to the Old School Bagel Cafe located at 2747 S I-35 Service Road in Moore. I had a few minutes to waste before work one day, so I stopped by to grab some breakfast. As soon as I walked in the door, I became a fan. The atmosphere was like most coffee shops — very calm and welcoming. However, this was better than walking into a coffee shop, because the restaurant smelled of fresh baked goods. After looking over the menu, I decided on the Breakfast Bagel, which comes on your choice of bagel with sausage, bacon or ham with egg and American cheese. I had this lovely combination on the honey oat bagel. First, let me say, the bagel was amazing. It was, without a doubt, the best bagel I’ve ever had. The honey oat bagel was cooked to perfection with the perfect amount of flavor, fluffiness and chewiness. The contents of my bagel were OK, but nothing more. I was hoping for fresh eggs and bacon, but that is not what I got. The egg and bacon were microwaved, which was disappointing. In addition to other breakfast bagels, croissants, muffins and cookies, they serve lunch sandwiches like the Sooner Club with turkey, ham, swiss cheese, bacon, lettuce, tomato and onions on your choice of bagel. 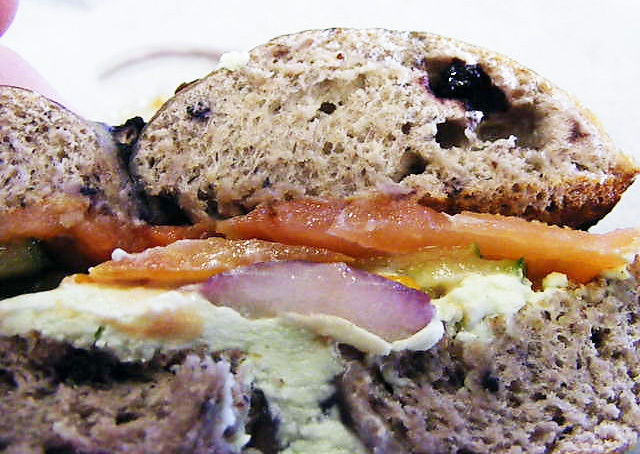 They also offer traditional sandwiches like Tuna Salad, Chicken Salad and BLT’s on bagels. I will be stopping by Old School Bagel Cafe in the near future to try their lunch menu. If you’re looking for some great fresh baked bagels, Old School is your place. Just remember to stop by early, because they are only open from 6 a.m. until 4 p.m. on weekdays and 7 a.m. until 3 p.m. on weekends. To find a location near you, visit www.oldschoolbagelcafe.com.